Anyone who knows me, understands how much I love a good magazine. This blog is mostly devoted to Martha's publishing ventures, despite her amazing work in television, radio and merchandising. Her magazines are my truest love. Lately, I've been exposed to some wonderful new lifestyle magazines - beautiful quarterly publications that focus on lifestyle subjects, such as crafting, collecting, cooking, entertaining, decorating and gardening. Below are the new quarterlies that now call my coffee table home. Each magazine has published less than 15 issues so far and each one is gorgeously designed, printed on high-quality paper in full colour. I highly recommend each of them! The printed version of this hugely popular online magazine is sold exclusively at Anthropologie stores and it's well worth locating a store to pick up a copy. Sweet Paul is almost completely free of advertisements, making it more like a charming book of seasonal recipes, craft ideas and DIY decorating than a newsstand paperback. It is essentially the male version of Martha Stewart Living! A must-read! This quarterly is a Canadian publication out of Calgary that now has readers and contributors from all over the world. It's subheading sums up its manifesto nicely: "A magazine for the creative and curious." Inside there is a multitude of articles and photo essays on collecting, crafting, stationery and textiles with features on artists and designers from around the world. There is also a wealth of online design sources in each issue. Uppercase is meant for anyone artistic and imaginative. This new magazine is on it's third issue. Described as a publication for those enthralled by the natural world, Wilder Quarterly is a visually-stimulating new magazine aimed at modern day growers and gardeners. The Brooklyn-based print publication features everything from local farmers and foodies to architects and amateur urban gardeners. Kinfolk touts itself as "a guide for small gatherings" and it delivers in spades. Based in Portland, Oregon, the magazine takes a deeply philosophical approach to gathering friends and family for casual meals. In place of recipes and how-tos you will find thoughtful essays and stunning photographs that examine the essence of why we entertain. 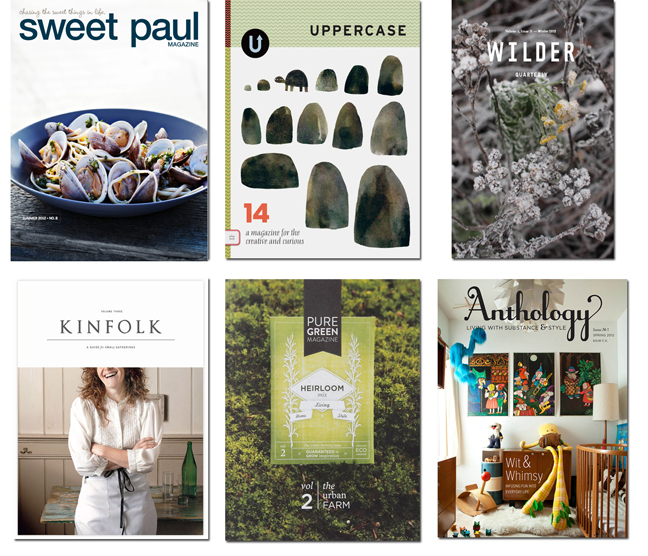 Kinfolk is a truly inspiring publication! Another Canadian offering, Pure Green is a Toronto-based publication that has published two print issues to date. It began as an online magazine several years ago. It contains features about urban gardening, decorating and cooking with beautifully-illustrated decorating features, growing guides and new recipes in each issue. "Living with substance and style" is the modus operandi of this San Francisco-based magazine. Anthology has published seven issues to date. It is primarily a home decorating magazine and seems to have its sights keenly set on the future of decorating: unfussy, incorporating the things we love, modern but never cold with an appreciation for the vintage and the heirloom. It is a beautiful magazine that I have found to be very inspiring to my own design sensibilities. Beautiful selection of magazines. I love Sweet Paul's magazine online amazing and inspiring. I checked the other magazines, beautiful and very interesting, thank you for introducing us to them. Have a wonderful weekend. It is the Queen's Diamond Jubilee this weekend in London and you can see gorgeous flowers everywhere. I love Peonies and would love to share some pics with you. We're celebrating the Jubilee in Canada, too. Charles and Camilla were here last week in honour of the celebrations. Thanks for the photos, Rowaida! Beautiful as always! ooh I love uppercase, but didn't know about wilder, I'm going to check it out. Thanks for letting us know about Spoonful, Thea! Looking forward to checking it out!